Is it getting to be too late to post pumpkin recipes? I sure hope not cause this is a really delicious one. While the original recipe called them bars, I found this more to be a cake. My reasoning was the cake was so moist that it was hard to cut it into actual bars and have them not get a little messy. Either way it is super tasty. A quick note: I halved the recipes and baked it in a 8"x11" pan. 2. In a large bowl, mix together first 7 ingredients. Stir in pumpkin, butter, eggs & vanilla until well blended. Stir in cranberries, then spread mixture into an ungreased 15"x10" jellyroll baking pan. 3. Bake 20-25 minutes or until a wooden pick inserted in center comes out clean. Cool completely in pan on wire rack. 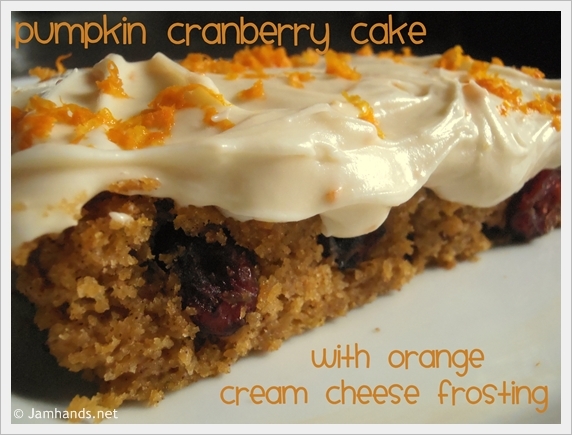 Pumpkin and cranberry sound so good together! In your directions for the frosting you say to "beat in the sour cream." yet there is no sour cream listed in the frosting ingredients. Was this just an "Oops!" in the frosting directions? I'm just wondering. macm219 - That was a typo. I modified a diff recipe for the frosting and I forgot to edit the instructions. Thank you for the heads up! Wohh this cake looks great!